Have a Safe and Restful February Break! Congratulations to Alee Rogers (Grade 3 Teacher at Sprague School) on the birth of her daughter, Evelyn Pearl Swanger, on February 12, 2017. We invite you to take a short survey based on the Draft Vision and Values Statement that can be found on the project website. The purpose of the Vision and Values Statement is to provide a description of an ideal Wellesley in approximately 20 years—it is about the future. The Vision and Values Statement should reflect the values that will guide the preparation and implementation of the Unified Plan. Teach at WINGS this Summer! We are looking for instructors to teach Academic and Enrichment courses for students in Kindergarten through Grade 5. Some course ideas from previous years include: woodworking, computers, sports, problem solving, creative writing. This year, classes will run for three hours in the morning and three hours in the afternoon and kids will not switch classes during the session. Click here for additional information on schedule and salary. If you are interested in teaching a course at the 2017 WINGS summer program, please go to this link and complete the Course Proposal form. 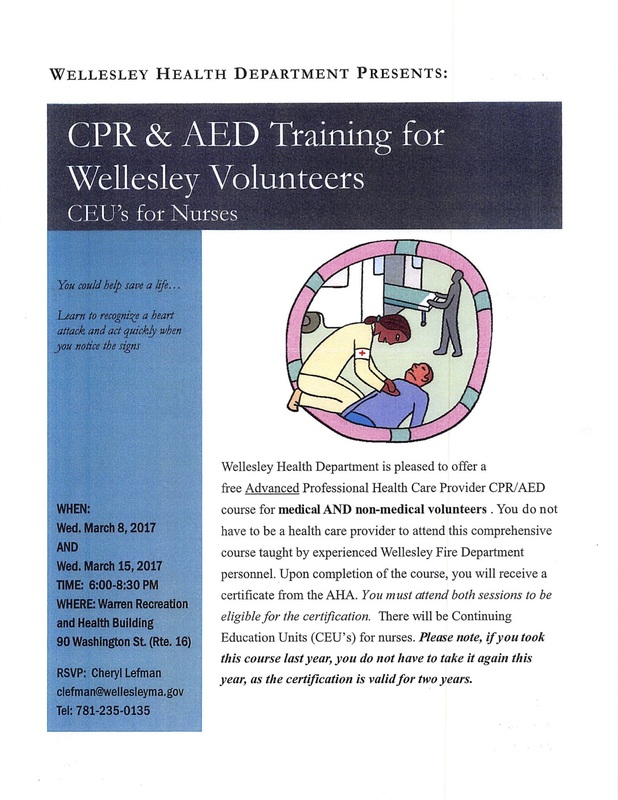 Once completed, the form can be emailed to Chad Norton at cnorton@wellesleyma.gov or dropped off at our office at 90 Washington Street, Wellesley. If you have any questions, please call Chad Norton, Assistant Director, Recreation Department, at 781‐235‐2370. 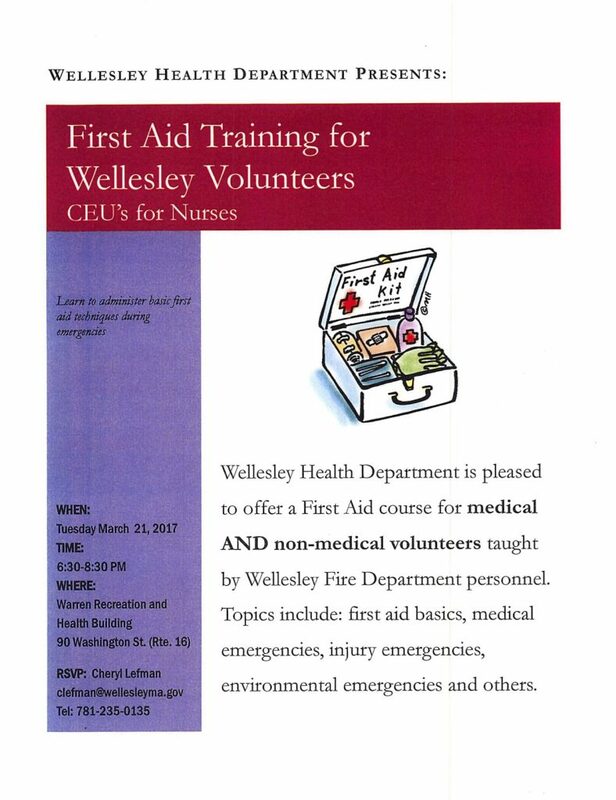 Children of teachers or nurses residing outside of Wellesley shall be entitled to attend Wellesley Public Schools without charge for tuition on a space-available basis (Article 12, WTA Unit A Contract). If you are interested in this benefit for the 2017-18 school year, please click here to access the form. 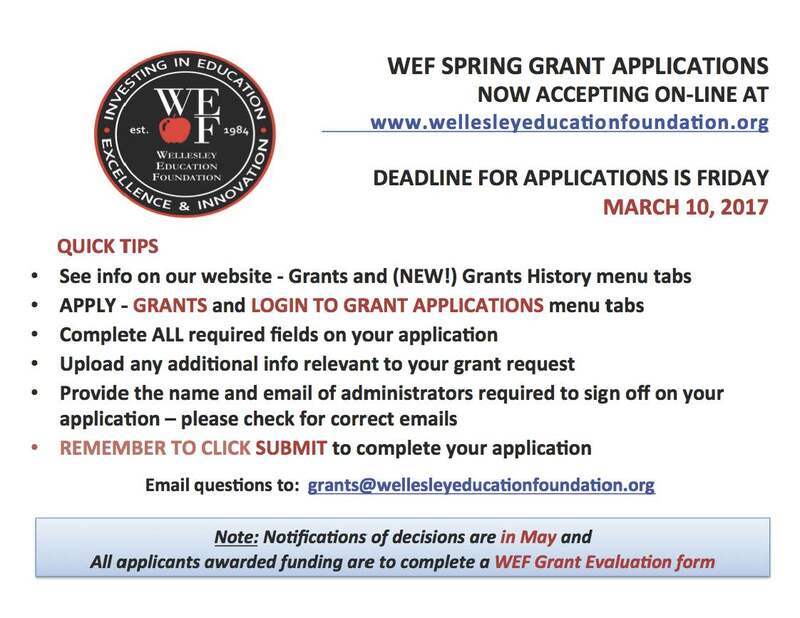 Once complete, please return the form, along with a letter of intent, to District Registrar Nancy Costigliola in Central Office or email it back to her at registrar@wellesleyps.org. The Application and Letter of Intent Deadline is May 1, 2017. ​​​​​Course reimbursement funding of $30,000 is available to distribute in FY18 among qualified teachers. This funding is for graduate course work done to obtain a master’s degree and/or a teacher’s professional license. Newly added benefits this year allow course reimbursement for specialists including physical therapists and occupational therapists to recertify their professional or allied health license. The Assistant Superintendent of Teaching and Learning must verify in advance that there are no further in-district specialist courses available in order for the specialists to apply for course reimbursement. To apply for this course reimbursement, please send by no later June 1, 2017, your name, evidence of your enrollment in an applicable master/doctoral degree program, name and description of the course, evidence of course cost (a billing statement), proof of payment (i.e. credit card statement, canceled check or receipt of payment), and transcript to Valerie Spruill, Administrative Assistant to the Director of Human Resources, spruillv. You will be notified of the amount awarded to you some time prior to the first paycheck in September 2017. Please note: all information must be received by June 1, 2017 or you will be disqualified for reimbursement. All courses must have occurred in the summer of 2016, fall of 2016 and spring of 2017 and have been completed by June 1, 2017. Any courses taken prior to the summer of 2016 will not count for reimbursement. If you are a core academic teacher and you currently hold a preliminary license, you must take the RETELL course and obtain the SEI Teacher Endorsement in order to renew your license as an initial license. For RETELL purposes, a core academic teacher is an early childhood, elementary, special education, English, reading, mathematics, science, civics and government, economics, history or geography teacher. The requirement to take the RETELL course applies to teachers with preliminary licenses, regardless of whether or not they had an ELL student in their classroom. Working in collaboration with the Wellesley Teachers’ Association, tentative arrangements have been made to offer the RETELL course in-District during the Spring 2017 semester. Please watch for additional information in upcoming Superintendent’s Bulletins. Benefits information is handled by the Town Hall Benefits Office. All benefit inquiries should be directed to Joanne Liburd at JLiburd or by calling 781-431-1019 extension 2244. Please be aware that we added a new feature called “Internal Job Postings” under the Faculty tab of the District’s website. We will post all of our internal jobs under this website tab. Therefore, you will no longer see internal job postings in the bulletin. This new way of posting will allow us to post internal positions any day of the week.